A tribute to Lula remains in the neighbourhood of Santa Candida in Curitiba, 100 metres from the Federal Police Headquarters. Photo: Ricardo Stuckert/ Flickr. The campaign for the up and coming presidential elections in Brazil officially began on the 15th of August, in a context of political chaos and uncertainty. The elections are due to be held on the 7th of October and according to the current polls, Lula da Silva, ex-president currently serving a prison sentence for corruption and money laundering charges, remains the favourite in the race. The situation is complex given that the entire political establishment has been affected by corruption scandals. The so called “coup” again ex-president Dilma Rousseff, the incarceration of Lula, and the political war these events have triggered will determine the future of democracy in Brazil. Here are the 4 essentials you should know in order to understand the current political climate and the #LulaLivre (free Lula) campaign. 1. Are we dealing with an ideologically driven case of political persecution? Sentenced to 12 years in jail over charges relating to corruption and money laundering, Lula was one of the most thoroughly investigated individuals caught up in the Lava Jato scandal (Operation Car Wash in English) that uncovered a huge corruption network within the state owned petrol giant, Petrobras. Numerous analysts have pointed out that the investigation and trial against Lula were far from neutral and objective. They argue that the right to unrestricted and extensive defence was not respected, and that false and illegal evidence was used. Numerous analysts have pointed out that the investigation and trial against Lula were far from neutral and objective. They argue that the right to unrestricted and extensive defence was not respected, and that false and illegal evidence was used. In any case, Lula’s sentence is not yet definite. There are appeals that have been presented to higher judicial bodies that have yet to be judged, that could even declare him innocent. Everything points to the fact that this case went beyond strictly judicial measures and spilled over into the political realm, becoming a case in which due process was not strictly applied. The case of Lula contrasts with that of Michel Temer, current president and right-wing politician, who has also been investigated for involvement in the Lava Jato scandal but appears to have received a different treatment from Lula. The conviction that judges have a double standard according to their ideological preferences is widely accepted across Brazil. The surveys regarding voter intentions reveal Lula as the most popular candidate, with an approval rating of 33% according to the latest IBOPE survey available. The same survey positions ultra-right wing candidate Jair Bolsonaro second with an approval rating of 15%, and centre candidate Marina Silva third with 7%. But in a scenario in which Lula doesn’t contend in the race, it is thought Bolsonaro’s ratings would rise to 17% and those of Silva to 13%, with 33% left blank or null. This week, the Prosecutor of Brazil rejected Lula’s candidacy due to the electoral law ‘Ficha Limpia’ (Clean record), that Lula himself created during his presidency, which prevents sentenced candidates from running in elections. On the 15th of August, the official registry of his candidacy before the Supreme Electoral Tribunal was made with the expectation that it will be vetoed and the PT will be forced to select another candidate. Since the return of democracy to Brazil in 1985, there has never been so much uncertainty regarding the political future of the nation. With 13 candidates taking part in the presidential race, and Lula as the favourite of them all, the divided country has failed to produce any other candidate reaching an approval rating of even 20%. The only certainty at this point in time is that the popular pressure of the #LulaLivre movement continues to grow as does the demand to allow his candidacy for the October elections. However, Brazilian electoral law could leave Lula’s status in limbo until three weeks before election day, increasing the air of uncertainty and tension. The fragmentation of the Brazilian electoral system makes it very difficult to predict what will occur. The strategy of the Worker’s Party (Lula’s political affiliation) is to maintain Lula as their candidate until the very end. If the Supreme Electoral Tribunal vetoes his candidacy, another candidate with the blessing of Lula will be chosen that is able to capitalise on his support to win the elections. 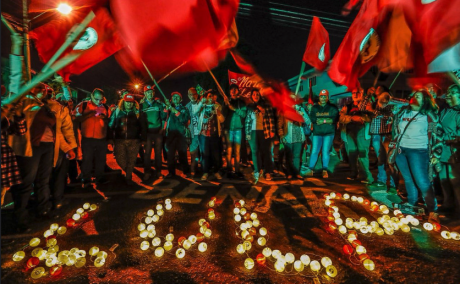 Despite the numerous international missions of Dilma Rousseff to secure support for the release of Lula, support from other countries within the region is lukewarm due to the delicacy of declaring their position on such a complex internal matter. The message underlying the recently launched campaign has airs of a battle between preserving a progressive democratic government in Brazil or paving the way for a right-wing government with authoritarian tendencies to govern. Lula has received many displays of support but only from the governments of Cuba and Venezuela, Bolivia and Nicaragua, and from Frente Amplio party in Uruguay and Spanish party Podemos, while presidents and politicians from other governments have not been so explicit. The issue has been avoided in the agendas of the majority of countries in the region, and solidarity with Lula’s cause is weak within the international sphere. All things considered, it seems inevitable that tension over such unusual elections in Brazil continues to grow with the passing of time. The message underlying the recently launched campaign has airs of a battle between preserving a progressive democratic government in Brazil or paving the way for a right-wing government with authoritarian tendencies to govern. If such a government were to win, this would only reinforce the conservative tendency that has been spreading across Latin America, with Mexico and Andrés López Obrador as one of the very few exceptions.